NBC's "The Voice" crowned Danielle Bradbery as the winner in Tuesday's season finale, earning her the grand prize of a recording contract with Universal Music Group. Bradbery, from Team Blake, beat out fellow finalists Michelle Chamuel and the Swon Brothers — each of whom performed on the telecast along with several other top musical acts. Adam Levine, Blake Shelton, Shakira and Usher were the season-four coaches of the hit musical competition series. Bradbery is a 16-year-old country artist from Texas who has never had a vocal lesson. With natural talent, her cousin encouraged her to start singing, and she soon had her first performance at a church festival. Bradbery cites Carrie Underwood, Miranda Lambert and Martina McBride as her musical influences. Follow her on Twitter: @dbradbery. "The Voice" ranked as the No. 1 reality show of the 2012-13 season, knocking "American Idol" out of the top spot for the first time in 10 years. The current cycle of "The Voice" ranked No. 1 in its timeslot in the 18-49 demo with every regular Monday and Tuesday telecast this cycle (excludes recaps). "The Voice" returns for its fifth cycle in the fall. Visit NBC.com's official show site: http://www.nbc.com/TheVoice. Please follow us on Facebook at http://www.facebook.com/NBCTheVoice and on Twitter at @NBCTheVoice and #TheVoice. >>'The Voice': Best. Episode. Ever. >>'The Voice': What about Audrey Karrasch vs. Jamila Thompson? 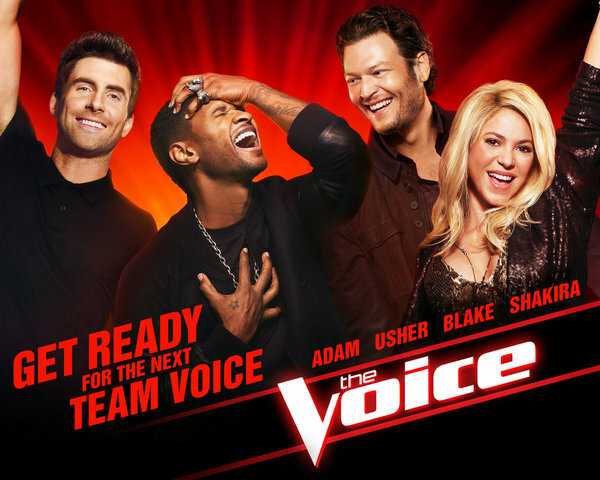 "The Voice" airs Monday and Tuesday at 8 p.m. on NBC. Find the show online at www.nbc.com/thevoice. Agina Alvarez/Burbank, Calif./@aginamusic Eliminated in the "Battle Rounds"
Amy Whitcomb/Orlando, Fla./@AmyLynnWhitcomb Eliminated in the "Knockouts"
Duncan Kamakana/Honolulu/@DuncanKamakana Eliminated in the "Battle Rounds"
Judith Hill/Los Angeles/@judith_hill Eliminated in the "Live Playoffs"
Karina Iglesias/Miami/@karinaiglesias_ Stolen by Team Shakira in the "Battle Rounds"
Eliminated in the "Live Playoffs"
Midas Whale (Ryan Hayes, Jon Peter Lewis)/Rexburg, Idaho/@midaswhale Eliminated in the "Knockouts"
Michael Austin/Norco, Calif./@MAustinCountry Eliminated in the "Battle Rounds"
Patrick Dodd/Memphis/@patrickdodd77 Eliminated in the "Battle Rounds"
Sarah Simmons/Memphis/@SarahSimMusic Eliminated in the "Live Playoffs"
Sasha Allen/New York City/@sashaallenmusic Stolen by Team Shakira in the "Battle Rounds"
Warren Stone/Hannah, S.C./@wsmusicsc Eliminated in the "Knockouts"
Caroline Glaser/St. Louis/@csg9801 Stolen by Team Adam in the "Battle Rounds" Eliminated in the "Live Playoffs"
Christian Porter/Stroudsburg/@porterchristian Eliminated in the "Battle Rounds"
Grace Askew/Memphis/@GraceAskew Eliminated in the "Knockouts"
Jacqui Sandell/Oakland, N.J./@Jacquimyar Eliminated in the "Battle Rounds"
Justin Rivers/Fairford, Ala./@justinrivers Eliminated in the "Live Playoffs"
Michelle Raitzin/Great Neck, N.Y./@michelleRaitzin Eliminated in the "Battle Rounds"
The Morgan Twins (Rhian and Cara) Rochester, N.Y./@morgan_twins Eliminated in the "Battle Rounds"
Savannah Berry/Houston/@SavannahBerry15 Eliminated in the "Knockouts"
Trevor Davis/San Diego/@TrevorDavisLive Eliminated in the "Battle Rounds"
Brandon Roush/Louisville/@TheBrandonRoush Eliminated in the "Battle Rounds"
C. Perkins/New Orleans/@cperkins504 Stolen by Team Usher in the "Battle Rounds"
Cathia/New York City (Bronx)/@cathiasings Stolen by Team Usher in the "Battle Rounds"
Garrett Gardner/Ringwood, N.J./@GarrettGardner2 Eliminated in the "Live Playoffs"
J'Sun/Brooklyn/@iLoveJsun Eliminated in the "Battle Rounds"
Kris Thomas/Memphis/@KrisThomasMusik Eliminated in the "Live Playoffs"
Luke Edgemon/Fayetteville, N.C./@LukeEdgemon Stolen by Team Blake in the "Battle Rounds"
Mark Andrew/Eden Prarie/Minn. @The_Mark_Andrew Eliminated in the "Battle Rounds"
Mary Miranda/Albuquerque/@MaryMiranda95 Eliminated in the "Knockouts"
Monique Abbadie/Miami/@Moniquesongbird Eliminated in the "Knockouts"
Shawna P./Orange Beach, Ala./@shawnapsings Eliminated in the "Knockouts"
Tawnya Reynolds/Nashville, Tenn./@TawnyaReynolds1 Eliminated in the "Knockouts"
Audrey Karrasch/Reno, Nev./@audreykarrasch Eliminated in the "Knockouts"
Chelsea M./Springfield, Va./@chelsee_em Eliminated in the "Battle Rounds"
Jamila Thompson/Atlanta/@viva_mila Eliminated in the "Battle Rounds"
Jeff Lewis/Baton Rouge, La./@iamjefflewis Eliminated in the "Battle Rounds"
Jessica Childress/Lancaster, Calif./@thejchildress Eliminated in the "Battle Rounds"
Jess Kellner/Austin, Texas/@jessicakellner3 Eliminated in the "Knockouts"
Josiah Hawley/Fort Smith, Ark./@josiahhawley Eliminated in the "Live Playoffs"
Orlando Dixon/Washington, D.C./@orlandodixon Stolen by Team Adam in the "Battle Rounds"
Ryan Innes/Provo, Utah/@ryaninnes Eliminated in the "Knockouts"
Taylor Beckham/Dallas/@taybeckham Stolen by Team Blake in the "Battle Rounds"
Vedo/Atlanta/@vedothesinger Eliminated in the "Live Playoffs"
For more information, visit http://www.nbc.com/TheVoice.